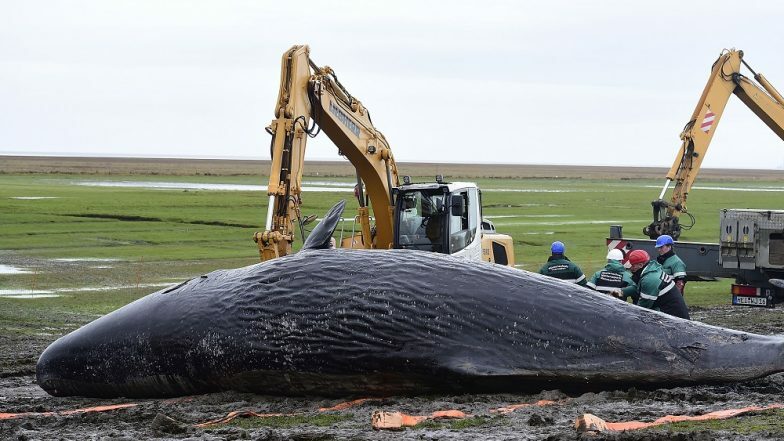 Manila, March 18: A starving whale with 40 kilos of plastic trash in its stomach has died after being washed ashore in the Philippines, activists said Monday, calling it one of the worst cases of poisoning they have seen. Environmental groups have tagged the Philippines as one of the world's biggest ocean polluters due to its reliance on single-use plastic. That sort of pollution, which is also widespread in other southeast Asian nations, regularly kills wildlife like whales and turtles that ingest the waste. In the latest case, a Cuvier's beaked whale died on Saturday in the southern province of Compostela Valley where it was stranded a day earlier, the government's regional fisheries bureau said. South African Diver Was Swallowed Alive By Whale But Miraculously Escaped (Watch Video). The agency and an environmental group performed a necropsy on the animal and found about 40 kilograms of plastic, including grocery bags and rice sacks. The animal died from starvation and was unable to eat because of the trash filling its stomach, said Darrell Blatchley, director of D' Bone Collector Museum Inc., which helped conduct the examination. "It's very disgusting and heartbreaking," he told AFP. "We've done necropsies on 61 dolphins and whales in the last 10 years and this is one of the biggest (amounts of plastic) we've seen." The death comes just weeks after the Global Alliance for Incinerator Alternative released a report on the "shocking" amount of single-use plastic in the Philippines, including nearly 60 billion sachets a year. The Philippines has strict laws on garbage disposal but environmentalists say these are poorly implemented. The problem also plagues the archipelago's neighbours, with a sperm whale dying in Indonesia last year with nearly six kilograms of plastic waste discovered in its stomach. In Thailand, a whale also died last year after swallowing more than 80 plastic bags. A green turtle, a protected species, suffered the same fate there in 2018.